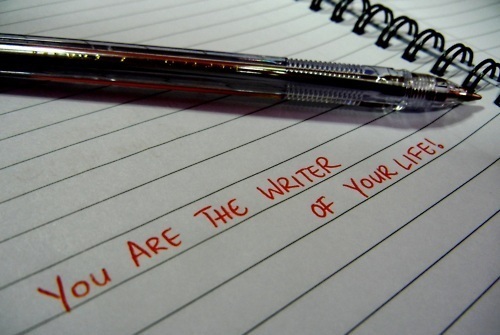 You Are The Writer – Darklightness – Mom Blog. 30's Girl. ← Happiness? What Does That Mean? The waiting game. We all play it. We wait to get “the job” we have always dreamed about, to have kids, get married, or to buy the perfect house. We waste our lives away, waiting for the right time. At some point through the course of our lives we take a minute to pause and realize that we wasted our lives away waiting to live. How do we maintain some control over our lives while overcoming all of the obstacles that are placed in our way? In recent years, I have had to face the challenge of finding a great job and in all honesty, I have possessed a defeatist’s attitude. I have gone through the emotions that many unemployed or dissatisfied employees have felt. I’ve been angry, frustrated or upset. For a long time, I let these emotions regarding one aspect of my life control my overall mood, and I stopped living my life. Until one day, I woke up and realized that I was missing the opportunity to live my life because I let the dissatisfaction of finding a job consume my life. I was allowing outside factors to affect my internal well-being. When I realized I was doing this, I decided something had to change and I took ownership of my life back. I adapted the saying “I know my worth and I understand my value”, and whenever I felt myself slipping into this negative funk I reminded myself of this. I didn’t want to waste my life away, nor did I want to allow finding the perfect job to take control of my life. My employment status was only one aspect of my life, it was not my entire life. In life, we make choices. Some choice will have a negative impact on our lives, while others will be positive. But our choices are our own and we control how obstacles in our lives affect how we choose to live our lives. Living our lives with a defeatist’s attitude, we become the loser. We need to take ownership of our lives and control how we allow outside factors affect how we choose to live our lives. This entry was posted in Uncategorized and tagged control, employment, growth, job, jobs, life, life lessons, quote, quotes. Bookmark the permalink.